The main constitutional business that ought to be on MPs’ minds at the moment is how to deliver the party leaders’ “Vow” to grant “extensive new powers” to the Scottish Parliament. The extent of powers to be transferred, and particularly the extent of power over tax that will be devolved, is far more urgent and important to the future of the UK than “English votes for English laws” (the principle that MPs for English constituencies should decide on proposals only affecting England). Both can be got on with at the same time, or course. But the fact that London politicians’ attention has so soon turned to England is a gift to Scottish nationalists, and has slowed the Union’s healing. The sooner they return to their Vow, the better. That doesn’t mean I’m against “English votes”. I’m for it, as the logical consequence of substantial devolution. But one of the keys to seeing straight on “English votes” is understanding the issue’s true proportion. In modern times, every government with a working UK majority has had an English majority as well. The only exceptions were the short-lived and knife-edge governments following the 1964 and February 1974 elections. Yes, 2015 is likely to be very close, and a similar situation might – just might – arise. But even that’s not all that probable: of Labour’s hundred-odd target seats, all but twelve are in England. At the moment, all kinds of wild fears are being spread about the principle of “English votes”. I’ve read the suggestion that it’d mean we needed an English First Minister, an English government or an English Parliament. All are nonsense. In truth, a sensible and unexciting set of tweaks to Commons procedure has already been recommended by the McKay Commission, which was tasked with looking at this. The parties should simply get on with implementing them. The McKay proposals are a bit complicated, and pretty dull – a sign perhaps of a sound, rather than a silly, constitutional reform. At their simplest, they amount to saying new laws with specific effects in England should be considered before second reading by an English Grand Committee (which just means all English MPs sitting together in the Commons chamber). If rejected by the committee, they should not normally be insisted upon by a majority including non-English members. Later in the bill’s passage, committee stage should also be dealt with by English-only backbenchers, the public bill committee’s makeup reflecting the party balance in England. The idea is, by means of these procedural changes, to give birth to a constitutional convention (in the modest sense of an understanding or practice) that non-English MPs should not normally vote on purely English matters. McKay does make some other more convoluted suggestions, but these are the heart of his recommendations. They’re sound; could be implemented quickly; and would ensure that the view of English MPs could not in normal circumstances be overridden by the views of others on matters only affecting England. They offer a complete and constitutionally literate solution to the “West Lothian question”. Some may object at this point that that weasel word normally leaves the door open for Scots MPs (or more accurately, an English minority with Scottish support) to impose their will in some circumstances. Yes, that’s true. McKay would not “ban” Scottish MPs from voting on English matters. But he’s quite right to stop short of that. While under the Sewel convention the Commons does not normally legislate on devolved matters without the consent of the Scottish Parliament, nothing in our constitution actually prevents English MPs from doing so, since Parliament as a whole remains sovereign. So those who would want to go further than McKay and “ban” Scots MPs from voting on English matters are not actually asking for balance, but for England to be more constitutionally iron-clad than Scotland. That’s why I say McKay’s moderate proposals are constitutionally literate. They’d achieve balance for England: no less but no more. But, some ask, what if by some chance we do happen to get one party next year with a UK majority, but without an English one? What if “the opposition” has a majority in England? Surely we need now to set the ground rules within which each must work, in case that happens? The answer’s an emphatic No. It’d be far better for MPs to have to muddle through, and make it up as they went along. If the government did not find itself with a majority in England, it would have to reach some kind of accommodation with other parties in order to implement its English programme – most obviously its health and education policies – or some agreed compromise programme. It would be a new species of hung Parliament. And just as it was helpful for Tory and LibDem politicians in 2010 not to work to a pre-ordained set of rules about how their agreement would have to work (they could have chosen a supply and confidence arrangement for instance) or even whether they reached one at all, so in this new type of hung Parliament fixed rules would be hindrance rather than a help. By the way, this sort of hung Parliament would I think be wise to get rid of the rigid framework of the Fixed-term Parliaments Act, which would otherwise prevent an early election. I mention that simply because it’s another good example of how obstructive fixed constitutional rules can be. Political solutions to political crises are better. So the way ahead is really quite straightforward. Most focus should be on fleshing out the Scottish “Vow”. At the same time, MPs should do the boring back room talk necessary to put McKay into practice. It’s far from the existential threat to Labour that even Labour politicians seem to assume, and is unlikely to be bettered from any party’s point of view. What we emphatically do not need is huge, wide-ranging or fundamental constitutional change, or any process – such as a constitutional convention (in the pompous sense of a council, assembly or folkmoot) – which would flirt with such upheaval. Designs like this, in spite of their surface grandeur, are actually opportunistic or self-serving, with the usual think-tank suspects flogging their predictable patent remedies as panaceas, and party politicians seeking advantage through delay. If there’s ever a “Gardner’s law”, it might be this: constitutional change in the UK should always be piecemeal and specific, never holistic. Those who repeatedly claim piecemeal change “has failed” are simply wrong. Some people think there should be more power for English cities and counties now. I agree. If politicians want that, they should make specific proposals in their manifestos. 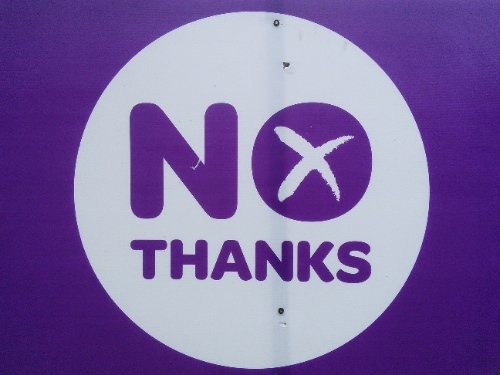 Some want 16 and 17 year olds to be given the vote, now they’ve taken part in the Scottish referendum. Again I agree, and I’d like that specific proposal to be brought forward now. Neither needs to wait on a constitutional talkfest. Others want more Lords reform. Again, fair enough. But it would be better done in small, agreed chunks, like taking the bishops out immediately, for example. The one serious piecemeal effort we’ve had at Lords reform worked: the hereditary peers have almost all gone. What did fail was Nick Clegg’s botched grand design. But that’s exactly the kind of rubbish that’d be revived by a constitutional seminar of the great and good. Proportional representation is an unwanted reform that campaigners would like to smuggle on to the agenda under cover of a grand constitutional jamboree. As is regional government. But the most ominous aspect of a constitutional convention would be its inevitable flirting with a “codified” or written constitution, which would be the daddy of all wrong-headed and holistic constitutional plans. A written constitution for the UK would be intended to limit politics by placing obstacles in its way. Whenever a radical new policy was advanced, opponents could object not on its merits, but on the basis of whether it was “constitutional” – as happens in the US, where health care reform hung on the vote of one judge. At the moment, EU law and human rights law limit what British politicians can achieve. Is the public completely happy about that? Or do these constraints cause tensions in our democracy? We all know it’s the latter. I’m prepared to defend the influence of both EU and human rights law in the UK; but that’s because they set only some limits on UK politics, and both are ultimately removable by Parliament. A written constitution would be for ever. It would bring in a judicialisation of politics and a disempowerment of voters that would amount to something like Britain’s current human rights controversy expanded in excelsis. It would hobble politics, and drive MPs even more towards an indistinguishable middle ground. Finally, it would prevent constitutional changes we’re likely to need in future, but can’t now foresee. Written constitutionalism in the UK poses as a movement for unspecified “change”; but in truth it aims at slowing down and stopping change. A written constitution is the most conservative proposal possible. But be in no doubt: many who call for a constitutional convention want precisely this. I had an exchange on Twitter during the Scottish referendum debate with someone who wanted new constitutional rules to stop another Scottish independence referendum being held so easily, for example. But the fact that that referendum happened (it’d be impossible in many countries with written constitutions) is proof of the strength and democratic radicalism of our arrangements, not their weakness. Politicians should get on with the limited changes needed following the Scottish vote – then allow the Union to settle. They mustn’t be allowed to throw our constitution into chaos. Very sensible (I’m not sure about the first paragraph). I am not a constitutional expert, though I have dabbled. At one time (under the Anglo-Irish agreement) I worked in Belfast as a UK representative negotiating with Irish government representatives. They used to tease us about not having a written constitution, but I was able to point out to them that every time the Irish constitution came up it was found to be blocking something which was politically useful or common sense or both. They used to tease us about not having a written constitution, but I was able to point out to them that every time the Irish constitution came up it was found to be blocking something which was politically useful or common sense or both. I may quote this in future. The overwhelming majority of countries do have codified constitutions. Should they rip them up? If not, then why is the UK so different? No, I don’t say other countries should rip up their written constitutions. My position implies no disrespect for them, just as praising the strengths of one written constitution (since they’re not all the same) does not imply all others are bad or should be changed. All I’m doing is resisting the apparently quite widespread assumption among British people that the UK should “rip up” (to deliberately use a bad metaphor) its own constitution. What’s different about the UK may just be a historical quirk. It’s also important to realise we’re not as unique as we think: I don’t think Israel and New Zealand have written constitutions, either. All countries don’t have to be the same, and our constitution has served us well, whatever people say. A written constitution nasty well be forever but the articles in it would be subject to addition removal or change through referendums. So if some government of the future had some brilliant new idea that would unfortunately be unconstitutional. They’d just have to convince the electorate of that and hold a referendum to make the necessary changes. Would referring to the electorate for unusual matters be really so impossible to countenance ? Are you sure the drafters would make amendment as easy as that? @huwOS – if a written constitution is that easy to change what is the point of it? We have basically reached the point that major constitutional changes require a referendum anyway – so from what you’re saying the outcome would be pretty much the same apart from minor tweaks to reflect common sense (the sort of things that a written constitution gets in the way of – see Oliver Miles above). One thing they could easily do would be to “pair” the Prime Minister and the Leader of the Opposition so that, whether they come from England or Scotland, they never vote on a topic. Let them do free votes, and there might be matters that directly affect their constituency, but keep them outside the whole English votes for English laws thing. Or, with 50+ million in England, 10 million under the devolved assemblies, do we accidentally block all outside-England MPs from becoming Prime Minister? How would the issue of the allocation of time be resolved? Scotland has 129 MSPs working (I assume) full time on the matters already devolved to it which leads me to believe that wielding devolved powers already takes a lot of time before we add more of them. It therefore seems unreasonable that MPs from regions with no skin in the game get a say in how much commons time is devoted to English issues or English MPs can unilaterally shut down the debate of UK wide issues in favour of English only issues. I don’t see a good way out of that in a parliament within a parliament approach. Hasn’t the issue you raise always existed, even before devolution? There have always been many separate pieces of legislation dealing with Scotland. What’s the benefit of stopping the party leaders voting? But at least it’s always been clear who settles it, whoever has the majority controls the timetable, you could make a good argument that it was unfair but that’s part of what devolution tackles. Imagine the case of a Labour majority in the UK and a Conservative majority in England, each party will want to push their own program of government the way the devolved parliaments can. I used to believe the unwritten constitution functioned quite well, until the issues surrounding the (previous instance of) proposed military action in Syria. Prior to that it was believed that the executive had the right to make war. Now, it seems to be believed that this right rests with parliament. In the absence of any formal process to change the constitution, who exactly decided that the PM’s decision to consult parliament, when previous PMs had not, set a permanent constitutional precedent? As far as I can see, it sets a precedent only because it is widely believed to have set a precedent, which in turn is true only because it was widely stated in the media to have set a precedent. If this is true, it effectively means that the media (and those who control it) have the power to “rewrite” our unwritten constitution. Which surely cannot be a healthy state of affairs? Surely critical issues of how the state functions, such as who has the right to take the country to war, should be properly codified with a defined procedure for amendment as necessary, rather than unwritten and subject to apparently arbitrary change based on the whims of the moment? I think MPs are making this change (I say “making” because I think this new constitutional convention is still bedding down) rather than the media. I’m in favour of this sort of development: the strength of the expectation of consulting Parliament can be worked out over time and by means of a number of real-life examples, rather than by you, me, MPs or experts sitting down and trying to think everything through in advance, hoping to get it all right. If you want any more persuasion, consider the US. There, the Constitution specifically deals with the right to declare war, yet there’s still an ongoing argument about when the President does and does not have to consult Congress over military action. Thanks for the reply, and that’s a fair argument, of course. My worry here is that MPs have to handle “real-life” situations like this in a (heavily media-influenced) emotional and political cauldron, under the influence of transient issues and without any real thought to future cases. If you think the MPs instituted the change, do you not find it incongruous that a constitutional change of this magnitude is initiated by a single vote in one house, while even a mundane technical change to a lesser law requires committee stages, multiple votes etc? Your argument is, I guess, the same as one would make for case law in general. The difference for me is that a judge setting a precedent in a complex and perhaps emotionally entangled case does not (hopefully) have one eye on what the press will say and the other on the next election. On the other hand, I do agree that drafting a written constitution is fraught with difficulty. My preference would not be an American-style attempt to write a perfect constitution on a blank page, but rather a careful codification of the existing unwritten constitution, together with a formal mechanism for subsequent amendment. If the current constitution is really as well-defined as people seem to think, I can’t help thinking it should be possible to write it down. And if it isn’t so well-defined, it leaves those of us outside the corridors of power with the nagging worry that the basis of our supposedly democratic society can be redefined by those in the know to suit vested interests. A written constitution would be for ever. It would bring in a judicialisation of politics and a disempowerment of voters that would amount to something like Britain’s current human rights controversy expanded in excelsis. It would hobble politics, and drive MPs even more towards an indistinguishable middle ground. Finally, it would prevent constitutional changes we’re likely to need in future, but can’t now foresee. A lot of hand-waving and overgeneralization here. 1. A written constitution is not “for ever”. Every constitution includes a procedure for its own amendment. A written constitution, unlike the current uncodified UK constitution, acknowledges that some principles are so important that it should take more than temporary control of 50% + 1 seats in the House of Commons to change them. 2. “Disempowerment” of voters? Voters, at least in England, are currently “disempowered” by having the ability to casting a potentially meaningful vote (for a candidate chosen by party insiders) only once every 5 years. (That’s assuming they live in a “marginal” constituency; if they don’t, they *never* get to cast a meaningful vote). Voters in many countries with written constitutions have far more opportunities to have their voice heard. Perhaps you meant to say “disempowerment of Whitehall”? 3. Comparing the UK to other countries that do have codified constitutions, I see no evidence that the latter “drive politicians to an indistinguishable middle ground”.